Home > News > The Rise of the Monster! 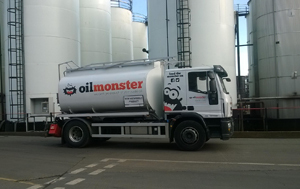 A year after joining Cleansing Service Group’s portfolio of companies, waste lubricating oil collection specialist Oil Monster (OM) has recorded a 100 per cent increase in volumes of oil collected and reprocessed. The Chester-based company, launched in 2012 to help small volume waste oil producers gain value from the valuable by-product, was acquired by CSG in 2013 as part of the group’s aim to become a major player in the waste oil treatment and recovery market. CSG has invested heavily in new technology designed to treat waste oil which can be converted into fuel oil for use at sites such as power stations and lime kilns. At the time of the acquisition, it also promised to make significant investment in new Oil Monster tanker vehicles to match increased customer demand for the service. Two new tankers, painted in eye-catching livery, have now come on stream. OM vehicles are now in operation from bases at Middlesbrough, Barnsley, Saltash in Cornwall, and at Cadishead where CSG operates its award-winning hazardous waste treatment site which includes specialist waste oil treatment facilities. Future expansion of OM facilities into other key geographical areas is planned. Oil Monster customers include independent garages, plant hire companies, commercial vehicle repair firms, scrap yards, and rail and aviation servicing facilities as well as national companies like Karcher and Newsprint International. Oil Monster business manager Nathan Pearson said the company aimed to be the UK’s best-known collector of waste oil. “We’re particularly proud that all our waste oil is refined into base oil ready to enter back into the lubricant market, which is a real environmentally-friendly alternative to recycled fuel oils which are burned and used once.